The father and daughter team of architect firm Hijjas Kasturi Associates reveal their common cause – nation building. THERE is something about a father and a daughter working together. The woman beside him, though no longer a child, is still his “little girl”. Such is the case with Hijjas Kasturi and his daughter Serina Hijjas, director of Hijjas Kasturi Associates Sdn Bhd. Both of them share a love for architecture and have strong views about what they feel are the important things in life. For Serina, her initiation into architecture was inevitable. As a child, she was always surrounded by some element or aspect of it. As she came to a crossroad, it just seemed natural to head for architectural school, given her love for art and sciences and the mentor she has. A strong advocate of environmental-friendly buildings, Serina, 45, the third in a family of five children, belongs to a generation that is more aware of sustainable designs and the merits that come with it. “Every generation has a cause and today’s generation of architects believe in sustainable designs,” says the mother of two. That does not mean her father is not in tune with the green movement. As the renowned Malaysian architect puts it, as far as he can remember, “houses during your (the writer’s) mother’s generation were green.” They had courtyards for ventilation, high ceilings and cross air ventilation among other green elements. Past generations were also conscious of the environment, but they did not put labels to it. Today, there are all sorts of green indexes and Serina is very much involved with Malaysia’s Green Building Index, a rating tool for developers and building owners to design and construct green, sustainable buildings that are energy and water-efficient with a healthier indoor environment. Hijjas belongs to Malaysia’s first generation of architects and nation building was a cause he and his contemporaries held dear during their time. “When I completed my studies, my sole aim was to come home. But when I go on my lectures overseas, I am appalled when Malaysian students tell me that they want to remain abroad. That all-consuming feeling ‘this is my Malaysia, this is my country’ is no longer with them as it was with me,” Hijjas says. Born in Singapore in 1936, Hijjas moved to Malaysia in 1967 and founded the School of Art and Architecture at the Mara Institute of Technology. Throughout his career, his single focus and goal has been nation-building. In a way, it was a sign of the times he was living in and he made the country’s challenge his own. For Hijjas, that challenge continues today as Malaysia and its regional counterparts continue to evolve economically and politically. “If you consider all our woes and problems, the current economic and financial crisis is insignificant. I have gone through so many upheavals – the Japanese occupation, the 1969 racial riots and various recessions. We have developed fast. Maybe the standard is not there. “Our first scholars were from Oxford and Cambridge in Britain and there are not many of those today. We have lost the ability to think critically and instead given ourselves a cause, not in nation-building, but in the pursuit of a lifestyle. That is why people, upon graduating, remain abroad,” says Hijjas. Serina admits it was challenging for her to return to Malaysia after living abroad for several years. There were adjustments to be made. “This is a nice place to live. I am proud to tell my kids they are Malaysian, although they look mixed. It is a pity that we are losing skill and talent abroad,” she says, referring to the country’s brain drain. Nevertheless, as Malaysians, both Serina and Hijjas are continuing their pursuit of nation building, though in different ways. Recently, Hijjas embarked on a RM20mil project to turn 15 shoplots in Penang’s heritage enclave into a five-star boutique hotel. Hijjas says it will be his first experience in his 40 years in practice to undertake the revival of heritage buildings and run a hotel. “This project is a personal challenge and a learning curve as I want to do something for Penang, especially in terms of heritage conservation. This project is also a tangible long-term investment,” he says. When completed, the shoplots – located along Clarke Road, Hutton Lane and Transfer Road – will have eight suites and 32 rooms. As Hijjas ponders the future of this country, Serina is there by his side learning from her dad, whom she calls “boss”. “He got a bargain (when I joined him). I have to set an example (for the rest),” says Serina. There is an easy banter between this father and daughter team, and yet in some ways, they are equals. In many respects, both Hijjas and Serina share the same philosophy – that things can be made better if everyone contributes. When it comes to work, they may differ in how they view architecture. Hijjas tends to look at the big picture, whereas Serina scrutinises the details. Serina goes into the various technicalities and functions whereas Hijjas talks about aesthetics and culture. Adds Serina: “We have different methods of doing things. Sometimes, we see the common good and we will go for the common good. We have to ask ourselves: ‘What contributions are you making to this country?’ I truly believe that what a person excels in is far more important than his lifestyle. The pursuit defines a person, not the lifestyle. She is miffed when introduced as “the daughter of a famous architect”. “I know this is a male-centric occupation. Despite 20 years of experience and having done some famous buildings – the Securities Commission building in Bukit Damansara being one of them – I am referred to in that way,” says Serina. While this father and daughter team may have different life stories, they share the same aim – nation-building. ● Located at the corner of Jalan Tun Sambanthan and Jalan Travers, Brickfields, KL. 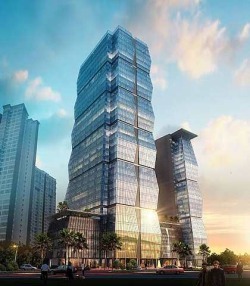 ● Comprises four primary building components, a 33-storey commercial office tower, a 21-storey serviced residences and a 5-storey podium consisting of office, conference and parking areas. ● Total built-up of about 1,450,000 sq ft.
● Among the first US Green Building Council’s Leadership in Energy and Environmental Design Certification, with a targeted gold rating.